The Tourism Department developed a micro-site linked to its main website to market the trail, which features the five IDA certified sites in the state: Clayton Lake State Park, Chaco Culture National Historical Park, Salinas Pueblo Missions National Monument, Cosmic Campground, and Capulin Volcano National Monument. A video on the site introduces potential visitors to the beauty and allure of the state’s dark skies, and links provide information about dark sky events all over the state. The Trail is promoted on social media and was pitched through a nationally distributed press release. The overall mission of the New Mexico Tourism Department, according to Griscom, is to appeal to the authentic visitor. He says that astro-tourism fits in with the type of visitor New Mexico is trying to attract and the state’s desire to capture visitors for a longer period of time. When tourists come to see the stars, they will need to spend the night somewhere, and will often plan day trips around their visits to Dark Sky Places. Aimee Awonohopay, Public and Industry Relations Director at the Tourism Department, says that many visitors from the East Coast have never seen dark skies or the Milky Way, and they enjoy visiting places off the beaten path. New Mexico’s dark skies offer adventurous travelers the opportunity to have an immersive, memorable experience. Awonohopay says that the darkness of the New Mexico sky was something the locals were always aware of, and that they are just beginning to realize what an asset it is and how meaningful it is to visitors. Griscom notes that dark sky tourism is valuable because it often occurs in the shoulder season — some of the best stargazing happens when the skies are clear in fall and winter. With many rural communities in the state struggling, Griscom says, “this is another innovative tourism opportunity that can add an economic boost to rural communities.” Although dark sky tourism is a niche market at the moment, it was a natural fit for New Mexico. On the whole, the response to the initiative has been positive. Although there is no formal mechanism for gathering feedback, communities seem to appreciate the Dark Sky Trail, and many more want to be on it. Several communities in the state are considering changes to their lighting ordinance so they can offer better viewing experiences. The Tourism Department is encouraging more communities to become certified through IDA programs — more dark sky places would help make the program even more robust, says Griscom. The Trail began as a tourism effort, but it has also become an effective way to promote conservation of dark skies. 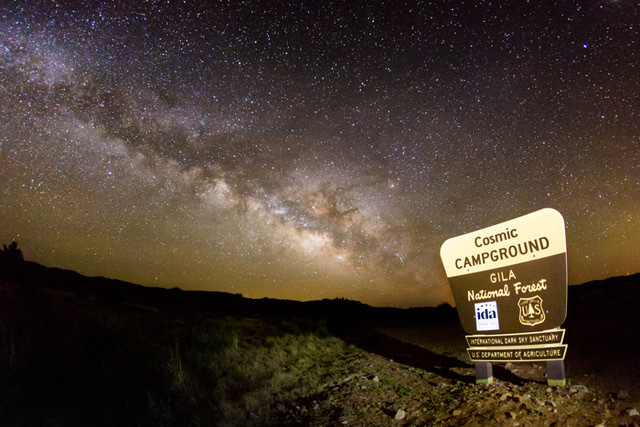 With a long history of star gazing, rich cultural connections, and several national observatories, Griscom says that developing New Mexico’s dark sky tourism was a “no-brainer.” No other states have packaged and marketed dark sky tourism like New Mexico has yet, but with Travel + Leisure naming the state among The World’s Top 10 Stargazing Spots, other states could learn from New Mexico’s dark sky trailblazing.